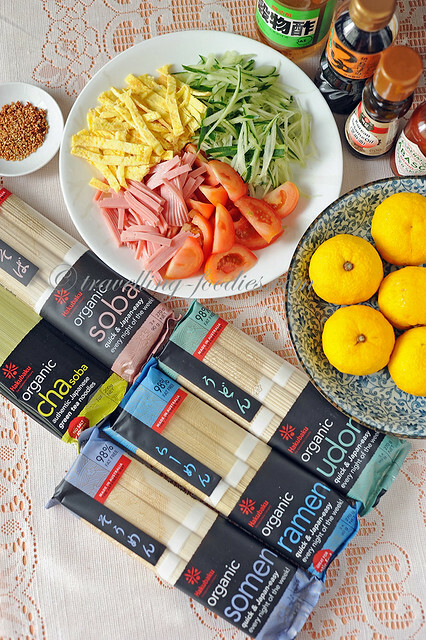 As the name implies, this noodle dish has its origins from Chinese cuisine just like how there are many popular “chuka” based dishes like mabo tofu, gyoza dumplings or even nanban chicken. Over the years, they have been adapted to suit Japanese tastebuds. 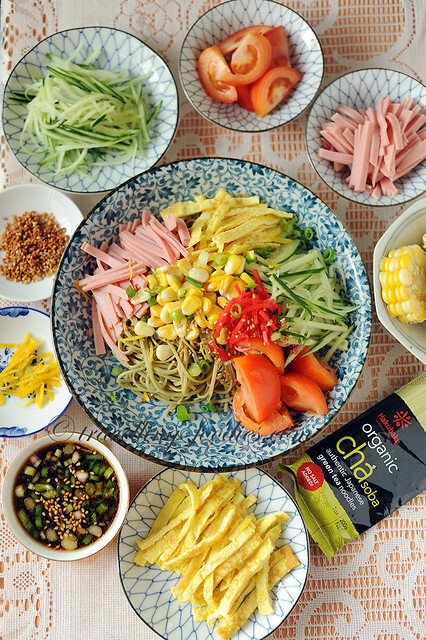 Likewise, hiyashi chuka is probably derived from the Chinese 凉面 or 冷面 which is basically cold or chilled noodles eaten with a drizzling sauce, sometimes shoyu based, sometimes sesame paste based. 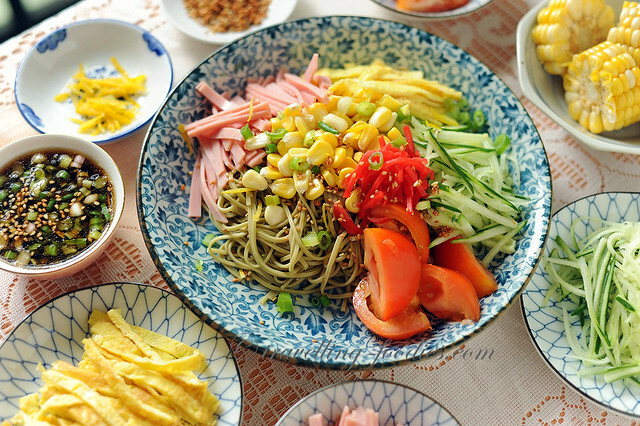 Traditionally hiyashi chuka in Japan uses ramen noodles but for my rendition, I’d used cha soba instead as soba noodles too are commonly enjoyed chilled so I see no reason why it can’t be used as a feasible substitute for ramen. The results were quite delish! And to make it even more interesting, I’d added fresh yuzu rind into the drizzle. That would be rather unconventional in Japan as yuzu is typically a winter-early spring citrus which is available only around this time of the year but I cannot resist using the zest in not on the drizzling sauce but also as a toss in condiment for the noodles itself. Absolutely love the aromas and zing this Japanese citrus provides! Crack eggs into bowl and add 1 tsp shoyu. Lightly beat with chopsticks. To a heated saucepan, add a bit of oil and pour beaten egg mixture into it. Cook until the top is almost dried up, flip the omelette over and cook for another 5 to 10 seconds. Transfer omelette into a plate to cool down slightly before cutting into thin strips. Cut ham and Japanese cucumber into thin strips. Pour all the drizzling sauce ingredients into a mixing bowl. Mix well to dissolve the sugar and set aside for later use. 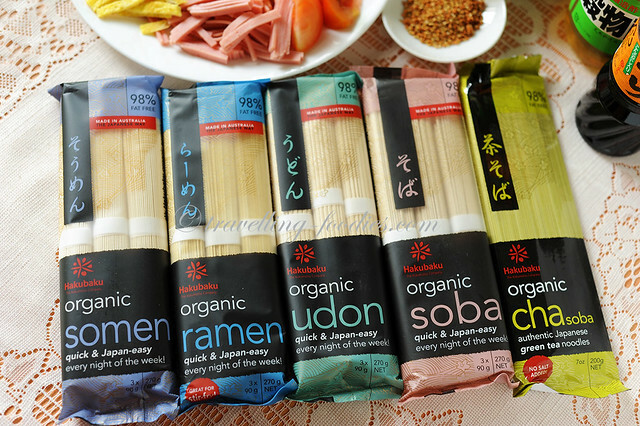 Cook cha soba or any Japanese noodles of your choice as per instructions on the packaging. Dip the cooked noodles very briefly in cold water to stop the cooking so that they would remain springy. Arrange the noodles into 2 plates. 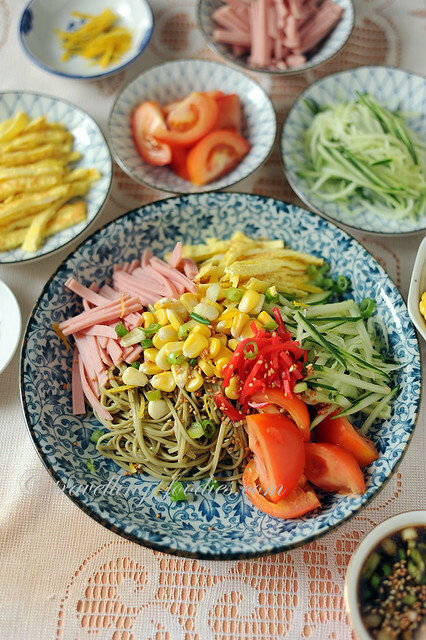 Place ham strips, omelette strips, cucumber strips, cut tomatoes around the noodles and then beni shoga and cooked corn kernels on top. To serve drizzle the sauce over the noodles and sprinkle with more toasted sesame seeds, yuzu rind zest and chopped spring onions. This entry was posted on November 30, 2017 by Alan (travellingfoodies). 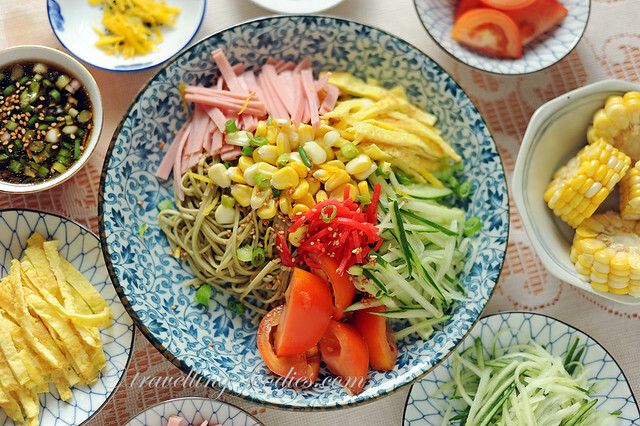 It was filed under Food, Simple Eats and was tagged with beni shoga, cha soba, chilled noodles, cold noodles, cucumber, ham, hiyashi chuka, japanese, japanese food, japanese noodles, omelette, yuzu, 冷面, 凉面. Yummy! By the way, your website is very cool! I also like your graphics layout. Very pleasing to the eye and makes everything look/taste better.